It’s one of those rare cosmic occurrences when I cross paths with someone who wrote in my high school yearbook, “Someday I can say I knew you when.” That the junior who penned those words grew up to be a veteran sports writer and political cartoonist for the Kansas City Star is matched only in awe-worthiness by the fact that he still has great hair. Some of us even remember Lee Judge as an aspiring young writer whose first book made from construction paper was a DIY epic held together with staples. Although we shouldn’t have had to wait decades for his next book, fans of baseball will proclaim that good things like Throwback: A Big League Catcher Tells How the Game Is Really Played (which he coauthored with MLB’s Jason Kendall) was well worth that wait. Q: Let’s time-travel back a moment to the day after graduation in 1971. With the future awaiting your first bold step into it, did you know at the time what you wanted to do for a living? A: I thought I did. At the time I wanted to be a commercial artist. Q: What was your very first job and what did you learn from it? A: I worked at Roos-Atkins clothing store. I learned that I didn’t want to work at Roos-Atkins clothing store. Q: Tell us about your passion for America’s favorite sport and your earliest recollection of going to a game. A: I’ve always loved baseball, probably because my father loved it as well. My first ballgames were Little League games in Rocklin, CA. It seemed like the whole town turned out for those. My first big league game was seeing Willie Mays and the San Francisco Giants. A: I hang out with all kinds of people—including Republicans. Q: When and where did you first meet Jason Kendall? A: At Kansas City’s Kauffman Stadium, 2010. Q: What prompted the two of you to team up and write a book about baseball together? A: Jason is not a fan of the media in general—few pro ballplayers are—but he liked what I was trying to do: write about the game from the ballplayer’s point of view. Most of us are interested in the results, but I also wanted to know about the process that led to the results: if a batter hits a home run, there’s a reason he hit that home run. How and why did it happen? Q: There’s no shortage of baseball books on today’s market. What do you feel best distinguishes this one from the competition? A: Jason Kendall is one of five catchers in the history of baseball to catch 2,000 games. Catchers know the game like no one else and Jason gives fans a look at what’s really going on out there: conversations, customs, strategy, how someone can break the unwritten rules and the penalties they pay for doing so. It’s a look inside the game from the ultimate insider. Q: Tell us about the creative process of coauthoring the book. For instance, did you work from an outline or just brainstorm topics as you went along? A: We decided to go position by position to give us some kind of guideline. I’d ask questions and he’d answer, but it was really more of a conversation than anything else. The book is not verbatim, but I did use Jason’s words—I just organized his thoughts. Q: The book is obviously targeted to diehard fans of the game but are there any elements that might appeal to those of us who aren’t as baseball-savvy? A: People who have read the book are finding it works for all types of fans. The game is much more entertaining when you pay attention and know what to look for. For instance: If you see the umpire walk out in front of home plate and bend over to clean it for no apparent reason, he’s probably having an argument with the catcher. The unwritten rule requires both umpire and catcher to stare straight ahead so no one will know they’re arguing. If the argument becomes too heated, the umpire will clean home plate so he can disguise the fact that he wanted to get into the catcher’s face and tell him to shut up, he’s heard enough. See? Isn’t that neat to know? Q: Why do baseball players speak in clichés? A: Tim Bogar—bench coach for the Texas Rangers—once told me that if ballplayers don’t know you or like you, all you get are clichés. No ball player ever got in trouble for being boring; they’re boring on purpose. If they like and trust you they’ll tell the truth, but never in one of those media scrums you see after games—too many people around. Here’s a clue: if you see a post-game interview and the player never looks in the reporters’ eyes, they probably don’t like that reporter. Eye contact is reserved for reporters they like or at least respect. Q: Umpires always seem to be the guys that everyone loves to argue with at vitriolic levels. As baseball insiders, is there a “correct” way to do this? A: As I mentioned earlier, at the plate everyone stares straight ahead—including the hitter. If the hitter suddenly feels the need to smooth out the dirt in the batter’s box with his feet, watch his lips: he’s probably taking the opportunity to tell the umpire what he thought of that last call. But smoothing out the dirt hides what he’s doing. 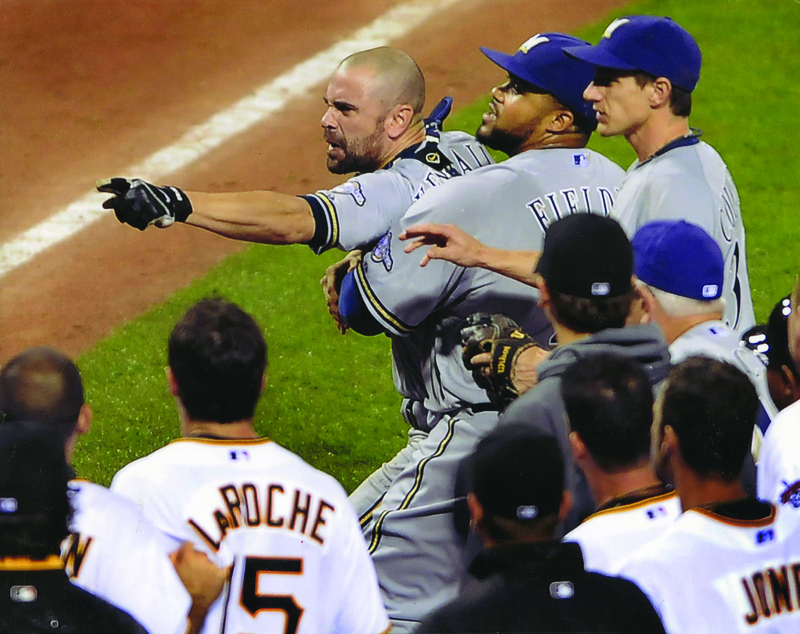 In the book Jason talks about using hitter-umpire disagreements to his advantage. If the hitter is complaining, the catcher can set up outside the strike zone and give the umpire a chance to retaliate. Jason would egg the umpire on with a “are you going to let him get away with that?” question, then set up outside the strike zone. Q: How do baseball players say hello during a game? A: If the hitter and catcher are friendly, in his first trip to the plate the hitter will tap the catcher’s shin guards with his bat—it’s how they say hello. Same thing on the bases: if the first baseman taps a runner with his mitt, they’re probably buddies. On the other hand, if the hitter taps a catcher’s shin guards and he’s not buddies with the catcher, that can start something. There’s a story in the book about what happened the first time Albert Pujols came to the plate and tapped Jason’s shin guards—it didn’t go well. Q: How do you spot a true tough guy versus a poser? A: If a tough guy gets hit by a pitch and is mad about it, he’s gone; he’ll charge the mound. A poser will stand at home plate, point the bat and yell at the pitcher and wait for his teammates to come out and break things up—they don’t really want to fight anybody, they just want to look tough. Tough guys aren’t afraid of the wall; they’ll go full-speed and try to climb the fence to bring back a home run. Guys who are softer slow up when they hit the warning track; they don’t want to bang into the wall. Same thing with breaking up double plays: hard-nosed players will hustle down and try to knock down the middle infielder attempting to turn the double play at second base. Guys who aren’t so tough will peel out of the base path and give the pivot man a clear throwing lane to first base—they don’t want to have a collision with an infielder or get hit by a thrown baseball. The tough guys get in front of bad hops and knock them down with their bodies if they miss the catch; other guys play the ball off to the side because they don’t like getting hit with the ball. The list goes on, but you get the drift.It’s right there for us to see if we know what to look for—that’s why we wrote the book; we tell you what to look for. Q: Is it possible during a game to predict what the next pitch will be? A: 2-0, 2-1, 3-0, 3-1 and sometimes 3-2 are known as “fastball” counts. In those counts pitchers need to throw a strike and a fastball is their best chance of doing so. So hitters load up in those counts and try to crush the ball. So pitchers either need to throw something other than a fastball—curve, slider, change, etc.—or throw a really well-located fastball. If fans pay attention they can predict the next pitch fairly accurately. Watch the between innings warm-up throws; if the pitcher can’t throw anything other than a fastball for a strike then, he’ll probably have to throw a fastball to a hitter during the inning. We tell fans how to spot fastballs and off-speed pitches. Q: How do you identify a dirty slide? A: Watch the runner’s feet: if his spikes are angled down, it’s a clean slide. If he comes in spikes up; he’s looking to do damage. Sometimes infielders invite this: they’ll receive a throw and “drop a knee.” That means they put their knee on the ground in the base path and block the runner off the base. Runners retaliate by coming in “spikes up” and cutting the infielder’s leg. Q: If no one has cheated, how can a pitcher end up with a scuffed baseball? A: The catcher throws the ball down to second base between innings and sometimes—kinda, sorta by accident—the catcher bounces the throw. That puts a scuff on the baseball. They infielders throw it around and give the scuffed baseball to the pitcher. If the umpire didn’t notice the throw bounced, the pitcher gets to pitch with it. There is no rule that says catchers must not bounce throws between innings. The pitcher has a scuffed baseball, but no one cheated. The players think all this worrying about scuffs is stupid because they play with a scuffed ball every time someone hits a grounder to an infielder or bounces a ball off the warning track—they keep those balls in play. They throw out pitches in the dirt, but let other scuffed balls remain in the game. It drives Jason crazy to see a young pitcher get a ball with a nice, useful scuff on it and then ask the umpire for a shiny new one. Q: What’s your favorite baseball movie and why? A: “Bull Durham” because Ron Shelton played minor league ball and got it right. Q: If you could have attended any baseball game in history, which game would you most want to have watched? A: Probably the World Series game where Carlton Fisk hit the extra-inning home run and waved it fair. I watched that one in a bar. But I did get to attend the seventh game of the Royals-Cardinals World series; I’ve got no complaints. Q: Greatest baseball player of all time? A: Hard to say, but I’ll go with Hank Aaron. Q: Where can readers learn more about the book and about the signings that you and Jason are doing? A: After every Royals game I post a story on “Judging the Royals” a web site that’s part of the Kansas City Star’s on-line offerings. Go to kansascity.com, click on sports and you’ll find my website. It’s inside baseball about the Royals, but the information applies to any team you watch. I’ll list new events there. Q: What’s next on your (home)plate? A: We’ll have to see how this book does: do fans really want this kind of information? If so, the publisher is interested in another book that takes baseball fans inside the game. A: Thanks for the opportunity—and the compliment about my hair.